This conference was part of the golden jubilee celebrations of the Center for the Study of Developing Societies and was organized by The Sarai Programme to commemorate 100 years of Indian cinema. 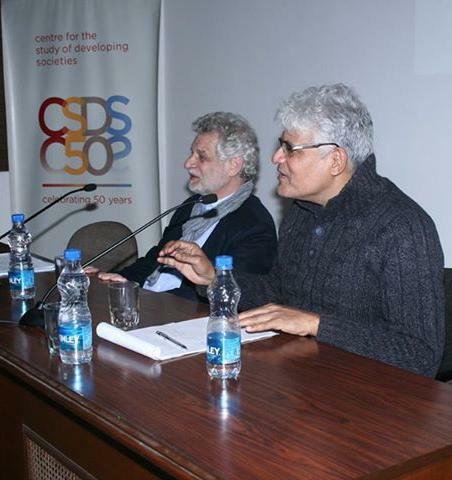 The conference sought to draw on the diverse heritage of Indian cinema to highlight the importance of cinema studies in the wider architecture of disciplinary engagements. This was with a view to bringing cinema into the academy as subject matter that required not only specialist analysis, but also as something which offered fresh perspectives, methods and materials to the human sciences. Scroll down for the report of sessions prepared by the rapporteurs. To this end, the conference organized the participation of historians, anthropologists, film, media and cultural studies scholars, legal scholars, as well as film and media practitioners motivated by an engagement with the wider social and political implications of their work with film and media art. This included a crucial engagement by practitioners and scholars who have developed databases of film material and digital tools that facilitate sophisticated research possibilities for the human sciences. In this regard, key initiatives that featured at the conference included the indiancine.ma online initiative to collect and annotate Indian cinema; the colonial film database, colonialfilm.org, that traverses colonial period film production across the British empire; the amateur film database, that draws upon colonial and other amateur film networks. The featuring of the colonial and amateur film initiatives highlight the bid to make this conference on Indian cinema a properly international one. This meant locating Indian film within a variety of international and transnational networks, rather than as an insularly conceived object of research. The international significance of the conference was also posed in terms of the way Indian cinema has also functioned as a marker of difference (for example from US cinema) in the field of cinema, in its size, the number of films made, the way it highlights song and dance, the informal nature of industrial relations, the way Indian film cultural practice has been animated through digital forms of access, production and circulation, the importance of cinema to political mobilization. 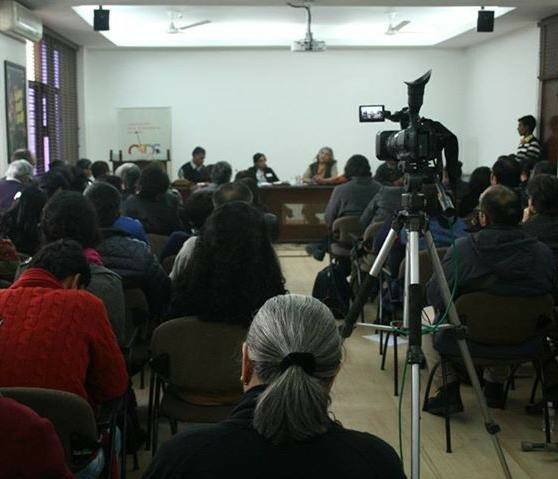 If one of the ideas here was to highlight Indian cinema’s international significance, as distinctive form, model and counter-model, the conference was also international in terms of drawing upon scholarship from outside India, primarily from the UK and the USA, from departments of film, cultural, media, historical and anthropological studies. We anticipate great possibilities of synergy then not only in the field of cinema scholarship, but within a broader orbit. If the international ramifications of Indian cinema as cultural form and research object was a key concern, so too was the bid to explore the regional, rather than only national networks, within which to study cinema. The conference drew upon scholarship on Pakistani and Bangladeshi cinema, and demonstrated the importance of regional networks for understanding the histories of cinema in the subcontinent, the importance of production sites such as Lahore in a longer history straddling the colonial and post-colonial periods, and the ways in which nation-states and nation-state archives proved to be complicated contexts both to access but also to obscure historical connections. This is arguably the first time that an Indian cinema conference has devoted attention to the linkages between Pakistani, Bangladeshi and Indian cinema histories. One of the conference objectives had been to draw Sri Lanka and also South East Asia into the project of tracking regional cinema histories. We hope we will be able to draw these other key spaces into research collaboration in the near future. The conference made an unprecedented investment in mapping the various archives in which the history of cinema could be accessed, including the online databases mentioned above which both drew upon existing archives, but could also draw upon personal collection of video, audio and print material, and would also combine archival materials in novel ways. Thus the colonial cinema initiative drew upon material from UK archives and museums such as the Imperial War Museum, the National Film Archive, and the British Empire and Commonwealth Museum, the amateur initiative has taken the Centre for South Asian Studies archive at Cambridge as an important resource, and indiancine.ma drew upon public and personal collections in its organization of relevant data to situate cinema. The conference also showcased personal collections in other ways, as in the curations which are described below. A significant component in this archival map was the conference’s acknowledgment of the importance of the Indian Government’s Films Division unit, and the way the current director, VS Kundu, had made its films and its exhibition space available. The conference hosted a major panel discussion between Kundu and independent filmmakers who have actively worked with Films Division to set up a live exhibition space for film screening and discussion, the FD Zone, in Mumbai and Delhi. Another concern of the conference was to frame film culture not as a finite product vested in the theatrical film object, but as a process composed of many different practices, technologies and techniques, and in relationship to other media. This is where the conference drew on curation and experimentation as key practices which could set up significant conversations about the material dimensions of the cinema. Curations on radio and cinema, film and gramophone, film-related print material (lobby cards, gramophone record covers, posters, paintings), interviews with film technicians were presented at the conference venue, offering researchers an understanding of the material, skill, and cultural forms which go into the making and exhibiting of cinema. Along with such a foregrounding of cinema as material, there were specially commissioned audio and video works which put together interpretations of phenomena such as sound in film, speech in film, radio in cinema and early film history. There was also curations of film screenings presented in a specially constructed `black box’, in which two well known Indian curators presented work on Indian experimental cinema, and a filmmaking initiative, CAMP, premiered their innovative work using many types of camera to capture the experience of sailors and sailing in the Indian ocean. Here, along with special seminar sessions, the question of experiment in cinema was broached as a form of research, as a way of looking at the process of assembling sounds and images to create meanings, and as way also of reflecting on the technological basis of film content, as it moved from celluloid forms to digital forms, and how this has altered the nature of film experience. A special CSDS Golden Jubilee Lecture, ‘Cinema after Film: On the Future of the Obsolescence of the Moving Image’, spoke to this focus on experiment. Delivered by Thomas Elsaesser, it touched upon the artistic film practice taking place in the digital era which has enabled a shift in configurations amongst filmmakers, audiences and institutions. The conference generated a substantial amount of print material, including a calendar drawn from the Sarai archives, a conference booklet with all the synopses, a poster, and the aforementioned commissioned audio and video works. The conference proceedings are also available in audio form. We have also engaged rapporteurs to provide an account of key discussions that emerged in the conference. Our publication plans include two possibilities: special issues of BioScope: South Asian Screen Studies, the Sage journal supported by CSDS/Sarai; and an anthology deriving from the conference, which we foresee to be a major reference book in the field of cinema studies and, more broadly, for the human sciences. Read the Conference Programme (PDF) and the Conference Brochure (PDF). Read the report of the sessions prepared by the rapporteurs (Abhija Ghosh, Debjani Dutta and Harmanpreet Kaur). The audio recordings of the presentations and discussions from the Conference will soon be shared on our website.